The East Coast of America has a lot of history behind it. European settlement in the area began around four centuries ago, and Native Americans have lived in the area for thousands of years more. Washington, D.C. and the surrounding area has a history that goes back over 200 years thanks to how and when we founded our nation’s capital. For instance, the community of Adelphi, Maryland, takes its name from the Adelphi Mill, which first opened for business in 1796. The neighborhoods that comprise this community are much younger, however: most only date back to World War II, during the first suburban housing boom. Still, this does make them historical in another sense, because while they may appear similar to modern homes, a lot about construction and interior design has changed over the past 70 years. When people say “they don’t make ‘em like they used to,” it’s usually meant wistfully. For one reason or another, we’ve lost track of something important, something we’ll never be able to get back. However, while there may have been something to the interior designs of old 40s and 50s homes, the fact that they don’t build houses like they used to is nothing but a positive. For instance, while we realize now how dangerous lead paint and asbestos insulation are, both were in use in residential homes all the way up through the 1960s. Construction workers and contractors would also cut corners during housing booms. They needed to build as many homes as possible as fast as possible, after all, and so they would skip a few safety checks or use up some of their old, outdated stock simply to keep up with demand. One way construction workers would cut corners on basements is by using concrete blocks and mortar instead of pouring it out as one solid mass. Concrete blocks are both cheaper and easier to put up in a hurry, but at the same time they’re more vulnerable to cracks and buckling since the grout between each block can act as a fault line. Because of this, and because of their age, foundation repair in Adelphi comes up more than a few times when it comes to renovating and determining property values. Buckling and slanting walls show up more often than you might expect, especially on hillsides where the surrounding soil tends to apply a lot of pressure as it moves downhill. If nothing is done to brace these walls, it could potentially cause the house above to tip over and fall to pieces. Fortunately, it’s not too hard to brace a wall against this pressure indefinitely when the job is done right. On the other hand, however, if these bracings are obvious to anyone who walks into the basement, it can make potential homebuyers leery, whether or not that’s justified. That means fewer potential buyers, and that means a drop in the property value. However, that’s no reason to avoid a foundation repair in Adelphi these days. While old internal bracings were made of heavy and obvious steel I-beams, modern materials like carbon fiber and newer steel alloys can keep a basement wall in place while being slim enough to look like part of the wall or hide behind the wooden frames and drywall panels of a finished basement. If you need extra bracing, you can also make use of wall anchors, steel poles which attach to the nearby bedrock buried beneath your home and which keep your basement walls as stable as you could hope for. 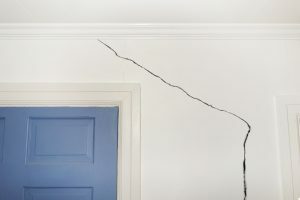 While a handy homeowner may be able to repair small cracks in basement walls and floors, it’s a good idea to bring in the professionals for a major foundation repair in Adelphi or elsewhere in the Washington Metro Area. AA Action Waterproofing happens to be as professional as they come, and we serve communities throughout Maryland and even into neighboring states like Pennsylvania, Delaware, and Virginia. Our first estimate is free and carries no obligation, so you can call us even if you don’t know how serious your problem is yet. So whether you need mold remediation in Bethesda, a crawlspace encapsulation in Langley Park, or a foundation repair in Adelphi, AA Action Waterproofing can help you out. We’ve been in operation since 1987, and in all those years we’ve never seen a basement or foundation we couldn’t fix.